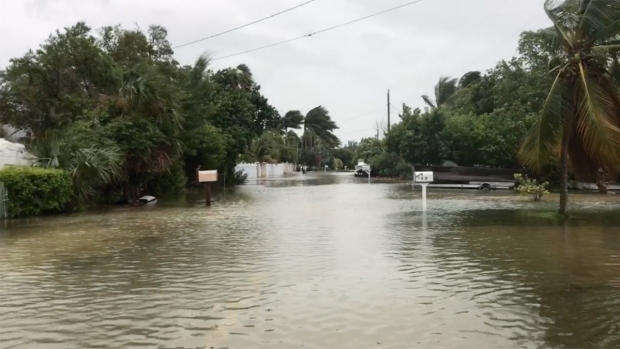 NBC 6's Angie Lassman has the latest information as the storm is downgraded from a hurricane after striking the Sunshine State. This story is updated when the National Hurricane Center releases a new advisory. Hurricane Irma gave Florida a coast-to-coast pummeling with winds up to 130 mph Sunday, swamping homes and boats, knocking out power to more than 3.3 million homes and businesses and toppling massive construction cranes over the Miami skyline. While it arrived in Florida as a Category 4 hurricane, by Monday morning it was down to a Category 1 with winds of 75 mph (120 kph). The 415-mile-wide storm blew ashore in the morning in the mostly cleared-out Florida Keys, then began a slow march up the state's west coast, its punishing winds extending clear across to Miami and West Palm Beach on the Atlantic side. As of 5 a.m. Monday, the system had weakened to barely a Category 1 storm with maximum sustained winds of 75 mph. The storm was centered about 60 miles northeast of Tampa and moving north-northwest near 18 mph. Irma left nearly 1 million customers in Miami-Dade without electricity as utilities around the state dealt with downed power lines, flooding and poor visibility. More than 5.5 million people were without power around the state. Report outages or check on their status by calling 1-800-4OUTAGE (800-468-8243) or visit Florida Power & Light Company’s storm information page here. Miami-Dade County issued a curfew starting at 7 p.m. Sunday through 7 a.m. Monday. Officials urged people to stay in their homes and shelters, even if it looks like Hurricane Irma has passed in some areas because moving around could be deadly. The county curfew was extended until further notice. The curfew was issued in order for county personnel to begin assessing the damage and clearing roads. Miami-Dade County spokesman Mike Hernandez said he's seen reports of people leaving the county's hurricane shelters. "Just because it seems like the weather is clearing up, that doesn't mean it's safe to get out on the roads," he said. President Donald Trump approved a declaration of a major disaster in Florida Sunday afternoon. Federal aid will become available to affected individuals in Charlotte, Collier, Hillsborough, Lee, Manatee, Miami-Dade, Monroe, Pinellas and Sarasota County. Many streets were flooded in downtown Miami and other cities. Trump said Irma will cost "a lot of money" but he isn't thinking about that yet. "Right now, we're worried about lives, not cost," he said. In addition to the 24 people killed during Irma's destructive trek across the Caribbean, at least two people were killed in a storm-related car crash in Hardee County Sunday morning. Julie Bridges, a Hardee County sheriff's deputy, drove into the storm to pick up supplies for a shelter where she was working. She collided with another car, and both Bridges and the other driver were killed. Florida Power & Light spokesman Rob Gould said Sunday it could take up to a week to restore power in Miami-Dade and Broward counties. Gould said about 500,000 people in the network were already back up thanks to a $3 billion grid upgrade that's been underway for the better part of a decade. 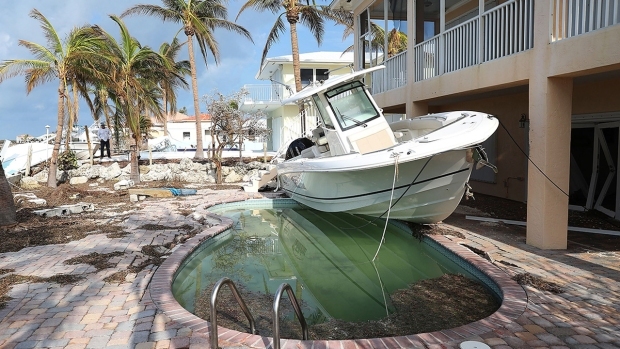 In the low-lying Keys, where a storm surge of over 10 feet was recorded, appliances and furniture were seen floating away, and Monroe County spokeswoman Cammy Clark said the ocean waters were filled with navigation hazards, including sunken boats and loose vessels. But the full extent of Irma's wrath there was not clear. The county administrator in the Florida Keys said crews will begin house-to-house searches Monday morning, looking for people who need help and assessing damage from Irma. Monroe County Administrator Roman Gastesi said relief will arrive on a C-130 military plane Monday morning at the Key West International Airport. Once it's light out, they'll check on survivors. They suspect they may find fatalities. Gastesi says they are "prepared for the worst." While Irma raked the state's Gulf Coast, forecasters warned that the entire state — including the Miami metropolitan area of 6 million people — was in danger because of the sheer size of the storm. A Miami woman who went into labor was guided through delivery by phone when authorities couldn't reach her in high winds and street flooding. Firefighters later took her to the hospital. In downtown Miami, two of the two dozen construction cranes looming over the skyline collapsed in the wind. No injuries were reported. City officials said it would have taken about two weeks to move the massive equipment. In Fort Lauderdale, a third crane collapsed around 5 p.m. Sunday. Nearly 7 million people in the Southeast United States were warned to evacuate, including 6.4 million in Florida alone. Storm surges, flooded roads and heavy rain were just some of the problems Irma brought to cities in southern Florida as it inched towards land Sunday morning. Irma made landfall just after 9 a.m. at Cudjoe Key, about 20 miles outside Key West. During the afternoon, it rounded Florida's southwestern corner and hugged the coast closely as it pushed toward Naples, Sanibel, Fort Myers and, beyond that, Sarasota, at 14 mph (23 kph). Forecasters had warned some spots could see a storm surge of up to 15 feet of water. "I said let's go and live the good life in paradise," she said. "And here we are." Some 400 miles north of the Keys, people in the Tampa-St. Petersburg area started bracing for the onslaught. The Tampa Bay area, with a population of about 3 million, has not taken a direct hit from a major hurricane since 1921. 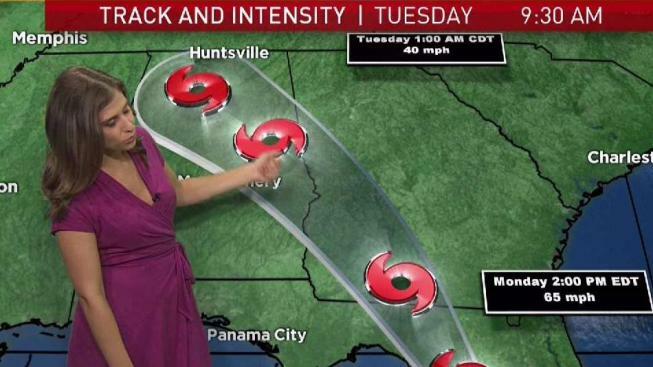 After leaving Florida, a weakened Irma is expected to push into Georgia, Alabama, Mississippi, Tennessee and beyond. A tropical storm warning was issued for the first time ever in Atlanta, some 200 miles from the sea. For days, forecasters had warned that Irma was taking dead aim at the Miami area and the rest of the state's Atlantic coast. But then Irma made a more pronounced westward shift that put a bull's-eye on the Tampa area — the result of what meteorologists said was an atmospheric tug-of-war between weather systems that nudged Irma and determined when it made its crucial right turn into Florida. "We know we are ground zero for this storm. We have avoided it for 90 years but our time has come to be ready," Tampa Mayor Bob Buckhorn tweeted Sunday morning. "We are about to get punched in the face by this storm. We need to be prepared." "We know we are ground zero for this storm. We have avoided it for 90 years but our time has come to be ready,"
Tampa Mayor Bob Buckhorn tweeted Sunday morningEarlier this week, Florida Gov. Rick Scott declared an emergency and told officials to impose mandatory evacuation orders for parts of the Miami metro area and the Florida Keys. More than 100,000 have taken refuge at shelters around the state, according to FloridaDisaster.org.